David Brooks hit a home run four years ago with "Bobos in Paradise," his sharp-eyed, witty, and highly enjoyable examination of "the new upper class and how they got there." Where that book's "comic sociology" helped get Brooks was into the upper class himself: He's now both an op-ed columnist with The New York Times and a moonlighting TV pundit on "The News Hour With Jim Lehrer" and elsewhere. It could even get Brooks into dictionaries someday for coining the word "bobos," short for "bourgeois bohemians." 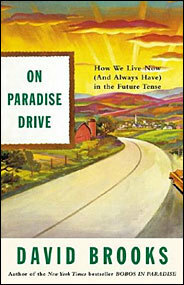 It's a good thing for him that "Bobos" came first, because its follow-up, "On Paradise Drive," is more of a strikeout. This time, Brooks promises three things: 1. "I will describe what life is really like in today's middle- and upper-middle-class suburbs"; 2. "I will try to solve the mystery of motivation"; 3. "I will try to answer the question: Are we as shallow as we look?" He swings wildly and misses on point one, having somehow lost his knack for effective satire. The first sign this may be a problem comes in his introduction, when Brooks warns that "if at times the book seems exaggerated, caricatured, impious, or sarcastic, my only excuse is that one of the distinctive traits of Americans is that we have often tried to tell the important truths about ourselves through humor, whether in the tall tales of Mark Twain, or the wisecracks of Will Rogers, Mr. Dooley, H. L. Mencken, or Garry Trudeau." Well, duh. But it's impossible to imagine any of these fellows — Twain or Mencken, especially — issuing such a caveat. Neither, for that matter, would the Brooks of "Bobos," and one wonders what sort of booboisie he imagines himself to be writing for this time out. His disclaimer isn't the worst of it, though. Brooks works his caricatures so hard hoping for laughs that there's very little time left over for describing "what life is really like" on his fantasized driving tour through America's geographically defined social strata. He moves from the "bike-messenger land" of hip urban neighborhoods through two types of inner suburbs ("crunchy" and "professional zones") and then out to the "suburban core" and beyond, but the only places he demonstrates having a genuine handle on are the bobo-dominated professional zones (no surprise), the suburban core (where he himself was raised), and the fast-growing, free-floating exurbs exemplified by towns like Mesa, Ariz., and Henderson, Nev. The satire, for the most part, is annoyingly ham-handed compared with the subtler, funnier stuff in "Bobos" — four full paragraphs, for example, are devoted to ridiculing a "discount but morally elevated" grocery chain found mostly in the crunchier inner suburbs, climaxing with the assertion that "if you smuggled a bag of Doritos into Trader Joe's, some preservative alarm would go off, and the whole place would have to be fumigated and resanctified." Brooks plays things straight initially as he passes through exurbia, the description of which is at least moderately fresh and interesting. Here, in these burgeoning new population centers, says Brooks, a managerial class of sales and marketing types tends to vote overwhelmingly Republican — sometimes 70 percent Republican — despite what Brooks deems an instinctive lack of interest in politics. "They come here, remember," writes Brooks, "with visions of friendships and happy barbecues." Alas, this soon launches Brooks into a tedious parable of "Patio Man" and ''Realtor Mom" making their rounds (he on a grill-buying excursion, she on a trip to the local Sam's Club) that is neither as funny nor as telling as he seems to believe. "As the happy couple emerges from the vehicles," it concludes, "it is clear that they are both visibly flushed and aroused. With the juices still flowing from their consumer conquests . . . the two erotically charged exurbanites mischievously bound up to the master suite and experience even higher stages of bliss on the Sealy Posturpedic mattress, on the stainproof Lycron carpeting, and finally and climactically, atop the Ethan Allen Utopia-line settee." Mercifully, Brooks backs off from the hyperbolic humor about a quarter of the way through "On Paradise Drive" and switches over to describing the American mind-set that links us all. Americans are future-obsessed, imaginative, hard-working, and idealistic, we're told, and Brooks trots out a long list of previous writers to buttress his case: Emerson, Whitman, John Adams, Santayana, Luigi Barzini, David Potter (whose 1954 book, "People of Plenty," was a model for this one), and many, many others. Which is to say that there isn't much here that hasn't already been explained better many times over. The mystery isn't so much what motivates Americans; the mystery is why we need Brooks to rehash all this for us. Brooks does offer at least one interesting new idea in the course of this, though: that this mind-set of ours has propelled us to "an unprecedented position in world affairs," that our being a suburban nation makes this "the age of the First Suburban Empire," and that "the paradox of suburbia is that people move there to pursue their private dreams." Which brings us to the question of whether we're as shallow as we look. "No, we are not," Brooks answers, summarily. There is truth in that, of course, but by now Brooks himself has already offered ample evidence to the contrary as well. Those grill-happy exurbanites too busy pursuing private dreams to pay close attention to how all that unprecedented power is wielded on their behalf, for instance, may just deserve a catchphrase of their own. Call them "bozos in paradise."